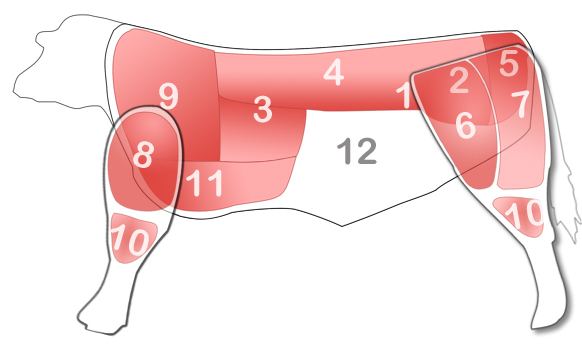 Beef is defined by its eleven prime cuts. These are basic sections from which roasts, steaks and other subdivisions are cut. The meat becomes progressively more tender as distance from "hoof and horn" increases. When looking at the diagram below note that the closer to the middle-back (4), the more tender the meat is as these muscles are the least worked. There are different naming conventions for meat cuts in Australia, Britain, France and the USA. We use the Australian convention. For example, locally we use the terms Eye Filet and Sirloin whereas in the USA they might say Tenderloin and Porterhouse. Organ meats such as Heart, Kidney and Liver are not included as part of a side of beef order, but can be purchased separately. As each side has a slightly different processing weight the proportional yields may vary plus or minus by a few percent. If you are unfamiliar with some of the cuts of beef in a side, please refer to the Know Your Cuts section of our website. Also visit our Recipes section for many nutritious and delicious cooking and preparation ideas for your family, friends and pets.